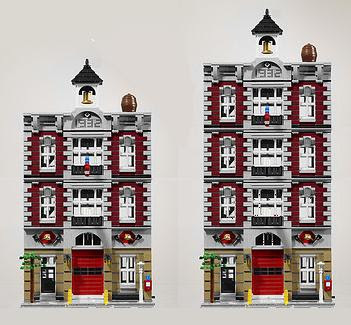 Brick Town Talk: Extra Floors - LEGO Town, Architecture, Building Tips, Inspiration Ideas, and more! WOW where did u find that?? WHEN ARE WE GOING TO SEE THE SECOND FLOOR INTERIOR, WITH THE KITCHEN AND PING PONG TABLE. This looks like floors have just been copied and pasted on top of each other in photoshop. Considering the flag normally comes out of the top of the bottom floor, not the bottom of the top floor. Though I will see, I like this more seeing what it would look like stacked up like that. This was just made in paint. I wanted to see what the building looked like with more floors. I did the same with the Town Plan Cinema if you remember.